As we left the station in El Paso, Texas, the clouds greyed. The collective phones on the train buzzed with an emergency flash flood alert. The train chugged forward into the empty desert, thundering skies filling the void. The passenger cars shook from the forceful electricity in the air. Soon enough, long fingers of lightning jumped down, striking the earth in the distance. I retreated to my cabin for a tumultuous sleep. Our train is small; an Amtrak engine pulls our two sleeping cars and one lounge car across the country. I was not quite sure how we would hold up in the flood that washed out Texas, but other than arrival delays, our trip has not been affected. We stopped in Austin and then San Antonio, where the ground was wet but not flooded. I only knew of the impact of the flood because of my family, who was reaching out to make sure I was okay, and because of a woman I met in Austin, who said the city had imposed a curfew on Sunday to try to keep people off of the roads. With very little internet connectivity on the train, I’ve not kept up with the news. 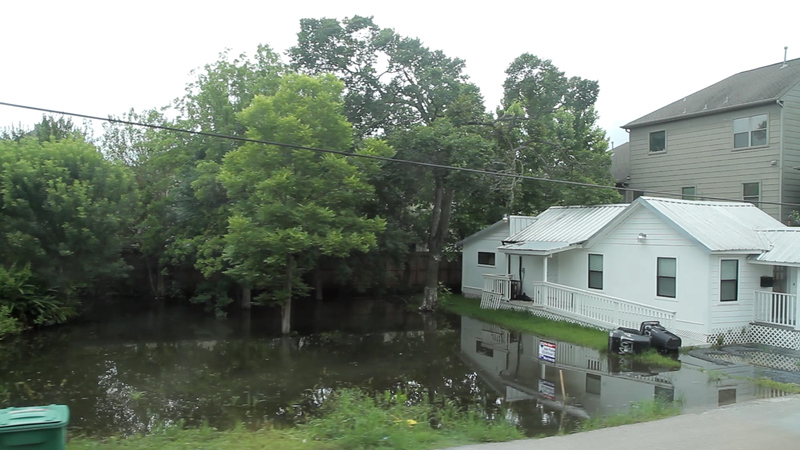 An empty lot turns into a pond next to a house after severe storms hit Houston.